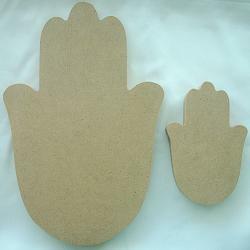 HAMSA HAND MDF SURFACE. AVAILABLE IN 2 SIZES: 6" AND 12". The Arabic word hamsa or hamesh in Hebrew, means five and refers to the five fingers in the hand. The hamsa hand is an old and popular amulet for protection from the evil eye. It is also considered to be a good luck charm. Popular in Jewish culture (known as the Hand of Miriam) and Islamic culture (known as the Hand of Fatima, daughter of Mohammed), it is predates both of the religions. This type of symbol is found in many cultures. The hand symbolizes the Creator's protective hand and is at times decorated with an eye (the Creators watchful eye). This special shaped surface has been created exclusively for Maryland Mosaics. Hanging keyhole on back. Decorated with beautiful tesserae, the Hamsa will be a unique and spiritual mosaic project.